Proper Hunt: Happy Friday! Here's to Punchy Kitchens! Happy Friday! Here's to Punchy Kitchens! 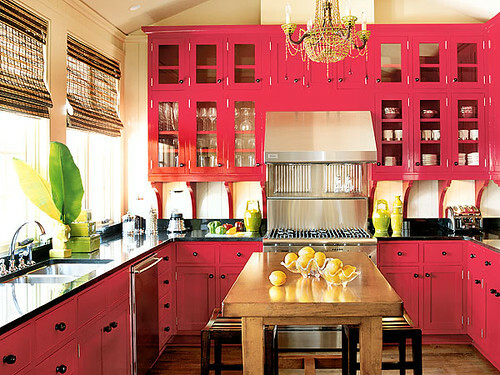 Normally, I'd prefer kitchens with white cabinets and sparkling carrera marble counter tops, but this bright pink one is quite fun. I especially like how the green accents really pop out (and the lemons too!) against the pink cabinets. And it's definitely smart to have white walls to balance out all of that color on the cabinets. Somehow, and I know I'll sound like a broken record, what really makes me like this kitchen is the chandelier. Crazy, I know! But lighting is very important, not just in the functional sense but aesthetically too. This is a totally fun kitchen. I am so with you on the chandelier. I have my cupboards painted sage green and I have a crystal chandelier in the kitchen area. WE had an old 1970 fluorescent light box so We removed that added molding and a vintage 1940s crystal chandelier, it is one of the fav. features in my kitchen. I absolutely LOVE your kitchen! I hope you don't mind me asking but where did you find that fab chandelier? ?